Handicap ramps - ramps for wheel-chairs, shopping carts, etc. About us: We have over 25 years experience in Pavement Maintenance & Management including: over 10 years hands-on experience, and over 10 years training, building equipment, and managing. We are committed to building a reputable company and dedicating our skills, service, and knowledge to benefit customers. Why choose Infrared? 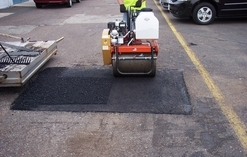 Infrared technology is the newest method in blacktop repairs and/or reshaping the existing surface. Infrared repairs leave no joints as they are thermally bonded, meaning the repair area is fused with the surrounding area so no water can penetrate. 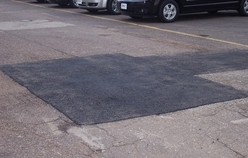 Infrared repairs are more convenient and economical to the customer and have less impact to public/traffic in parking lots or roads. 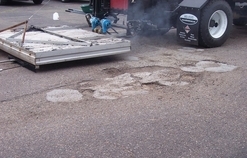 Typical Infrared repairs are completed in 15-20 minutes and can be driven on almost immediately making it much easier to maintain high traffic areas. 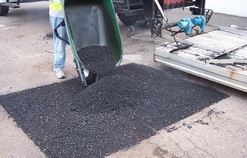 It is also a permanent repair that re-uses 80% of the original asphalt making the process more environmentally friendly.